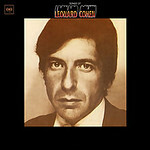 Leonard Cohen's first album, released in 1967. Includes Suzanne, Sisters of Mercy, So Long Marianne, and Hey That's No Way to Say Goodbye. Song lyrics at https://www.leonardcohenfiles.com/songind.html. Discography at http://www.leonardcohenfiles.com/master.html.